It has an anthill called “ROHINI” or “RUVVANI” (In Konkani) deep inside the Sanctum Sanctorum. It is believed to be an abode of live serpents or Nagas and is worshipped as VASUKI- the second among the NAVANAGAS. Devadarshan the Holy Oracle,which made the temple famous throughout the country is closely associated with this RUVVANI..The Devadarshan is not manifesting since 76 years..-The mud oozing out of the Ruvvani is given as Prasad only on special request to the chief priest.This is called “Moola Prasad” and is considered very sacred. TheRuvvani is surrounded by granite Lingas namely-Chandramauleeshwara, Nandikesha, Veerabhadra, Varuna and Kubera. – The Ruvvani and these Lingas are not visible to us. Only the main priests have access to them. Prominently visible to us in the Sanctum Sanctorum on ground level is the Linga of Srimath Anantheshwaraafter whom this temple is named. This Linga is believed to be “SWAYAMBHOO” or ”UDBHAVA”- selfbornmeaning not sculpted or erected.As per researcher Sri. Govinda Pai-the year of discovery of this Linga could not be ascertained but surely it dates back to pre-Christian Era (BC). The name “Manjeshwar” is derived from this Deity which is also known as Manjarisha. The visible Altar in the Sanctum called SIHMASANA is made of laterite stone using mud for joints .Wooden planks are fitted as base for the Deities. 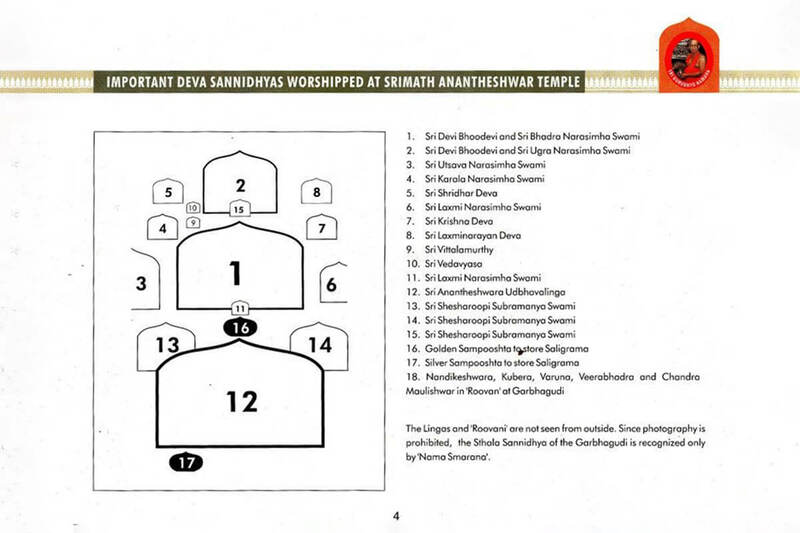 This structure is based on the Ruvvani..No changes are made to this Simhasana during renovation. Only wooden planks which had deteriorated have been replaced by new teak planks. The Simhasana has the Presiding Deity Sri BhadraNarasimha accompanied by Sridevi and Bhoodevi.This magnificent idol made of Panchaloha (An alloy made from 5 Metals) is right in the centre of the Simhasana.The last reinstallation(Punarpratishta) of this idol was done in 1804AD by H.H.Srimath Vibhudendra Teertha-the 14th Pontiff of Sri .Kashi Math Samsthan.Varanasi.-the guiding Math of the Temple. Just above the Srimadanatheshwara Linga are two Shesha idols which are worshipped as Nagaroopi Subrahmanya.There is one more such idol on the Ruvvani . The three Shesha idols are taken out during various Utsavas alternately..During Devadarshan one such idol is carried by the Patri on His head. Recently, During renovation(Jeernodhara) one new Shesha idol was anointed to replace a 1300 year old Shesha idol which was in a damaged condition.This new Shesha idol moulded in silver( identical to the one which was damaged) was installed by H.H.Srimath. Sudheendra Teertha –the present Pontiff of Sri.Kashi Math accompanied by His Pattashishya H.H.Srimath Samyameendra Teertha on 27th April 2011. There are many other ancient Narasimha idols like Sri Ugranarasimha ,Sri.Laxminarasimha,Sri. Karala Narasimha ,Sri Utsava Narasimha .This perhaps inspired Srimath Madhwacharya to call this shrine“NRISIMHA GEHA”(The House of NRISIMHA) when He visited the temple in 1293AD. The Simhasana also accommodates Deities of Sri. Krishna,Sri Sridhara,Sri .Vittala,Sri.Vedavyasa,and more.Among these, the Srikrishna idol is brought out to the Teertha Mantapa for pooja on Janmashtami day and Sri Vedavyasa idol is brought out to the Inner Vasantha Mantapa and placed on spiritual books forSaraswati Pooja during Mahanavami .During regular utsavas the Utsavanarasimha idol and one of the Shesharoopi Subrahmanya idols are decorated with prabhavali and taken out in procession in various Vaahanas. (Vehicles). The Inner sanctum also has hundreds of old and rare SALIGRAMAS collected over many centuries.A very rare BALAMURI SHANKHA(A conch with a right bend) is used during daily pooja. Hundreds of gold Naga idols given away by devotees also receive pooja on a daily basis. 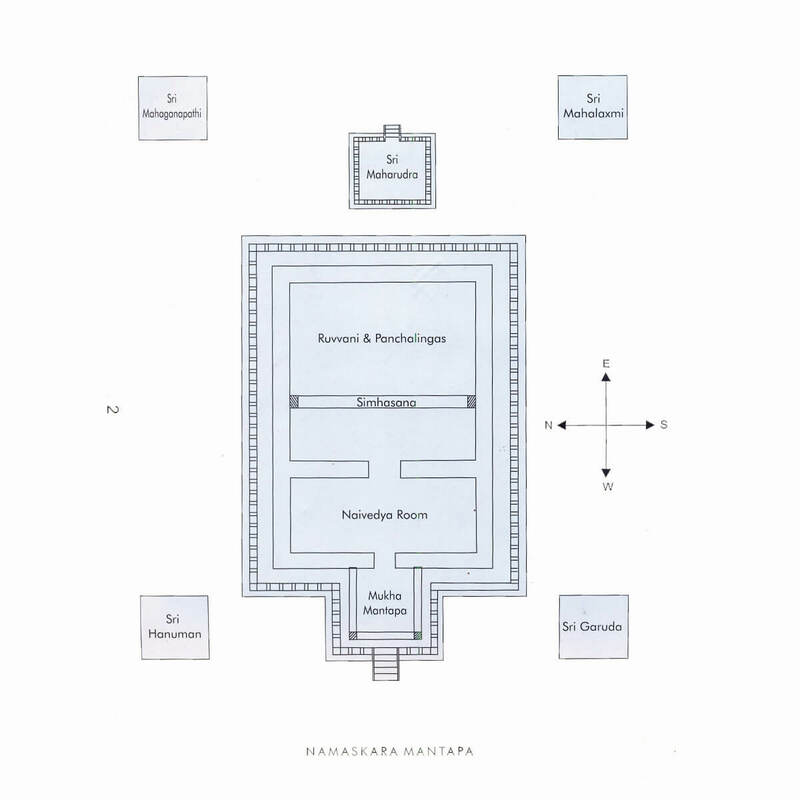 Natural Flooring-The Srigarbhagriha ,the Naivedya room,the TeerthaMantapa –the three parts of the Sri. Garbhagriha have only natural soil as flooring.No cement or tile is used anywhere inside. Even the wall plaster is done with a natural bonding material called “Surkhi”.made from essentially organic substances like jaggery.No other chemicals are allowed inside and no electrical wiring is permitted..The ceiling above the Srigarbhagriha is now made with teak and is covered with a thick layer of the same soil which was there for centuries. Below this soil cover is a layer of Banda leaves which are traditionally used as anti termite and anti insects treatment.. The soil flooring is covered with a layer of cowdung brought from the temple Goshala from time to time. The entry to the Sanctum is restricted to the priests of the traditional archaka families only.. Exception is only to our Guruvaryas. The area in front of the Sanctum is called NADE. This Nade has tremendous significance in Manjeshwar.The divine vibration a devotee experiences.in this location is difficult to explain.Ithas to be only experienced. It is quite common to see devotees during the Arati time engrossed in the view of the Sanctum with folded hands and moist eyes full of emotions. This is the location where many a boons were granted by the Lord during Devadarshan for centuries together.The last Devadarshan had promised in 1935 AD that even in the absence of the Devadarsan devotees who pray faithfully in that Nade will surely get their wishes fulfilled. Thousands visit the temple from far and near only to stand here and pray. It is believed that any spoken word on this spot becomes a reality and therefore one has to be careful when he visits the temple and stands in the Nade He should have pure, positive thoughts and words without illwill.That is a place for complete surrender to the Lord Almighty.. The Nade is also used for offering “Tulabharam”s – A special offering to the Lord as a mark of gratitude for wishes granted. The offering can be coconuts, rice, jaggery, sandalwood etc equivalent of one’s bodyweight. The temple management organizes this seva on request..